Cream Filled Brownie Bites - Chocolate Chocolate and More! 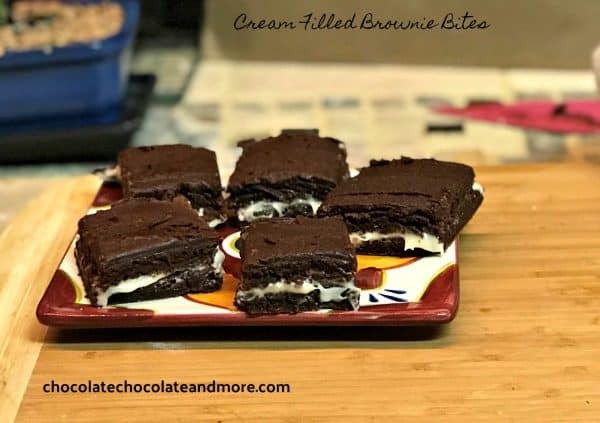 These cream filled brownie bites are a yummy mix-up on your basic brownie recipe. The best part of having a creamy filling is that you can make it any flavor your little heart desires! And top it all with a rich chocolate frosting? I just hope this doesn’t send you into a sugar coma! For this recipe, I used their Belgian Cocoa Powder and chocolate and vanilla extract (yes, the extract has chocolate AND vanilla in it!) Because of the flexibility of this recipe, if you want to change up the flavor, it is as simple as changing the flavor of the extract you use. There are three different parts to this recipe — the brownies, the filling and the icing. I was able to make the filling while the brownies baked. I made the icing while the brownies cooled. 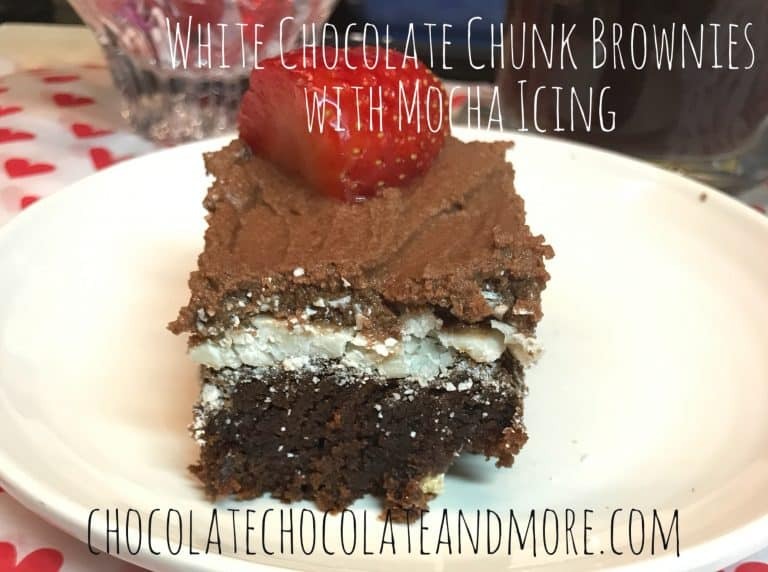 You want to make sure you have already made the “brownie sandwich” before you make the icing. The icing is spreadable as soon as you are done whisking it. However, if you allow it to cool, it will get clumpy and will be hard to spread. After you frost the brownies, it works best to refrigerate them for about 10 minutes to allow everything to set. This makes it easier to cut into squares without the filling oozing out. 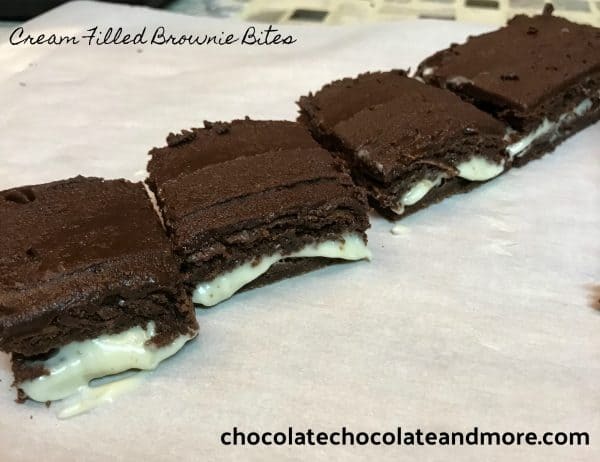 I cut my Cream Filled Brownie Bites into small squares, however you can cut yours into any size or shape you like. You can also top with nuts, berries, candy pieces — whatever you’d like. This is a highly customizable recipe, which is one of the reasons I love it! Grease a large 9" x 13" baking pan or 15" x 10" jelly roll pan. Remove from heat and mix in Cocoa Metro cocoa powder until smooth. In a separate bowl, beat eggs on low speed. Gradually add sugar, beating until smooth. Combine flour, baking powder and salt and add to egg mixture. Spread batter in prepared pan and bake 12 to 14 minutes or until top springs back when touched lightly in center. Cool completely in pan on wire rack, and then turn onto a flat surface or cutting board. Cut brownie in half making two equal sections. Spread one half with the cream cheese filling (see below) and then top with second half. After icing has set, cut into bite-sized pieces. Cream together the softened cream cheese, softened butter or margarine and Cocoa Metro chocolate and vanilla extract in a small bowl. Gradually add powdered sugar, and mix until smooth and creamy. In a small saucepan over medium-high heat, bring sugar and water to boiling. Remove from heat, and whisk in chocolate chips, stirring until melted. 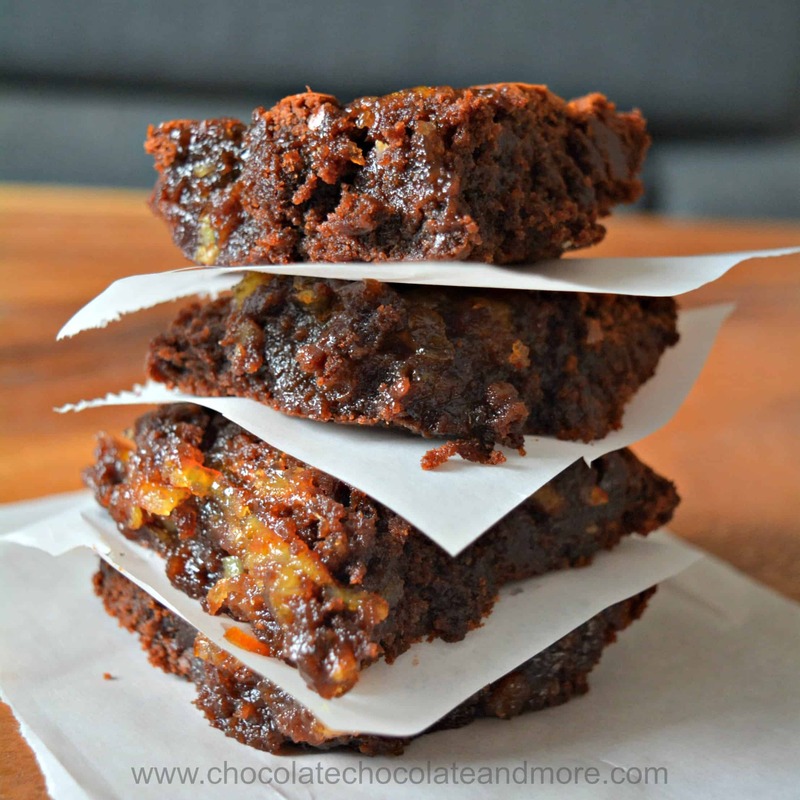 Looking for more flavored brownies? OMG these sound delicious and need to be made soon !!!!! 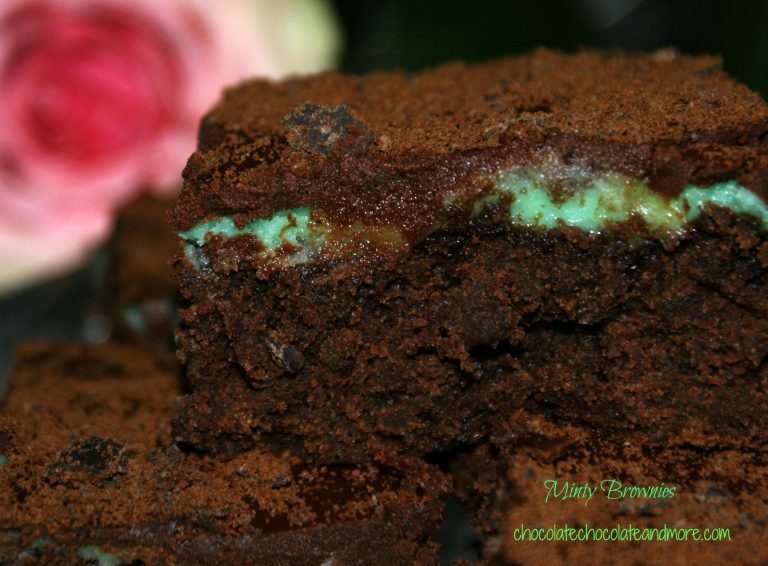 Are you cutting the baked brownies horizontal or vertical. ? Pretty sure i know But might add this to clarify. Making Brownies for grandsons birthday Sunday..so this will be the THIRD choice for everyone. Of course have none of her special choc and vanilla products so will have to substitute. Also am high Altitude so will tweak them some. Hope it turns out well. Hi Leslie…I cut them horizontally along the longest line (13″) first, and then cross cut . I think you meant to ask if I cut them on the diagonal — from corner to corner — and that is also a good option! (making them diamonds instead of squares). But no matter how you cut them, they will taste great! (And no, you don’t need the fancy stuff — your basic Hershey’s baking cocoa and vanilla extract will work just fine!) Let me know how they turn out, and thanks for reading! One word that define this is marvelous. The look of the brownie filled my mouth with water. Thanks for sharing such an adorable recipe. What a lovely dish, i went through the video and very much inspired by the way you made this. Hopefully i am going to make this at home.